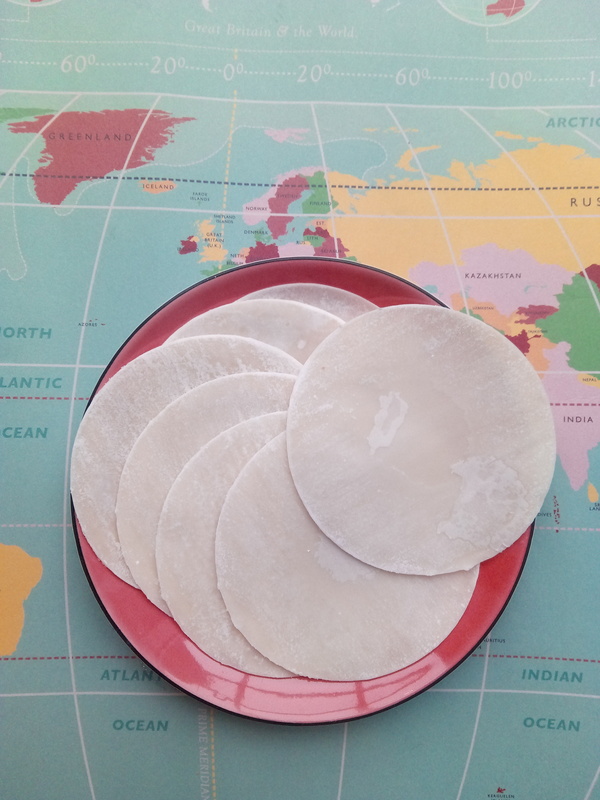 We’ve talked many times about how food from your favourite countries can help cure travel and home sickness (see our post: How to battle feeling homesick.) We love China, and our time there was very happy. 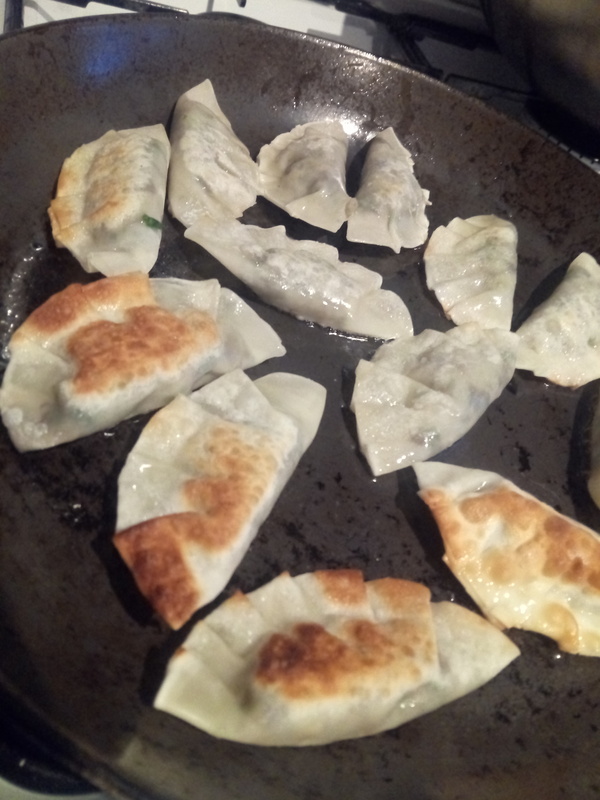 So, making dumplings (or, depending on what you prefer to call them, #jiaozi, #gyoza, #potstickers, #锅贴, and many more) in our house is an occasion! Here’s how we do it – we hope it helps you make a delicious dish. 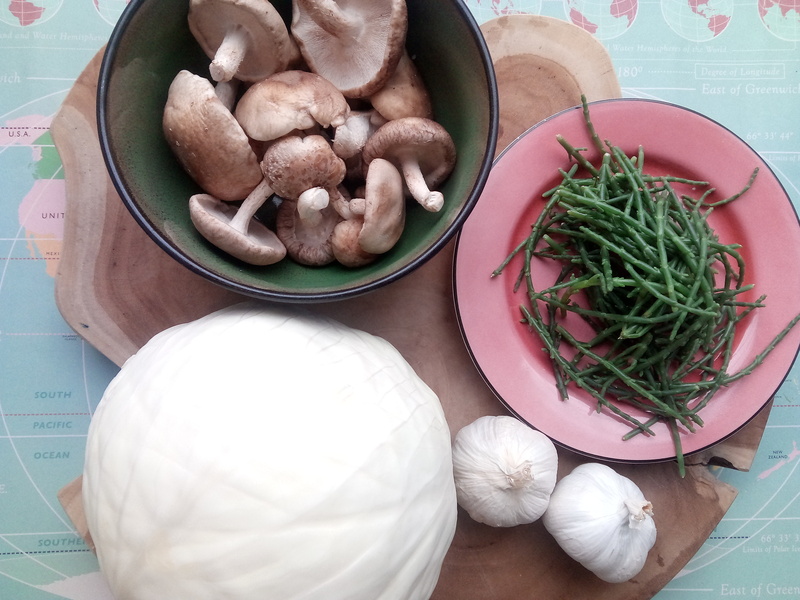 White cabbage, garlic, samphire, shittake mushrooms, and half an onion. No dumpling is ready without a dipping sauce. 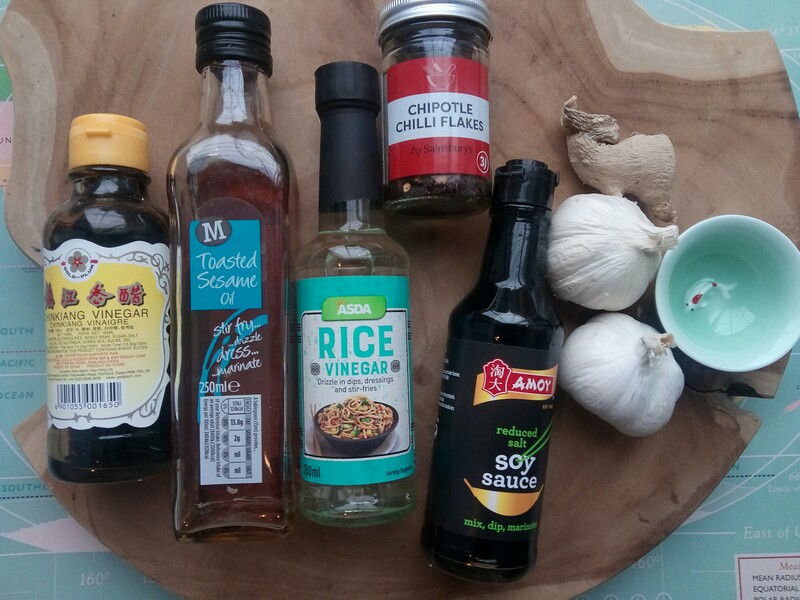 For one dipping sauce, the ingredients are toasted sesame seed oil, rice vinegar, soy sauce, chilli, garlic and ginger. 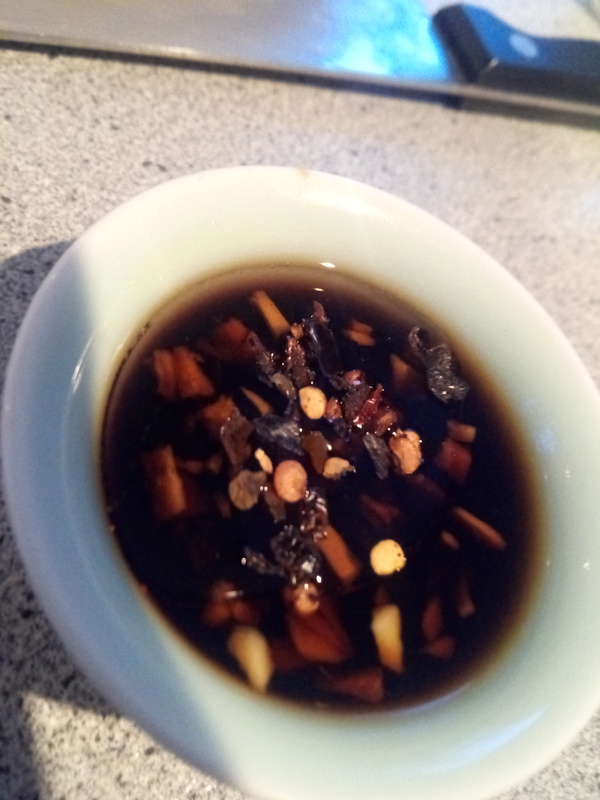 The Chinkiang vinegar is something we use on it’s own for dipping (it can be bought from any Chinese supermarket). 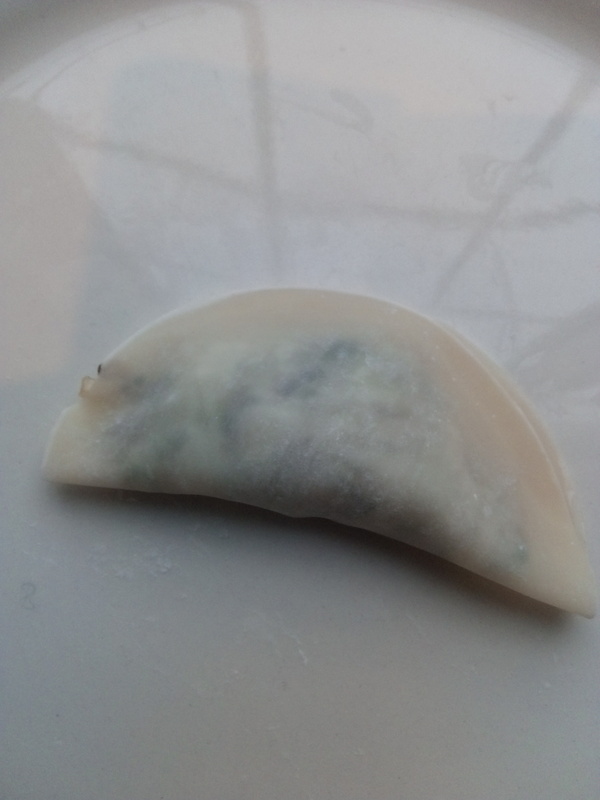 The dumpling skins, again, can be bought in a Chinese supermarket. You can make your own from scratch, but we don’t! First of all, finely chop your dumpling ingredients. 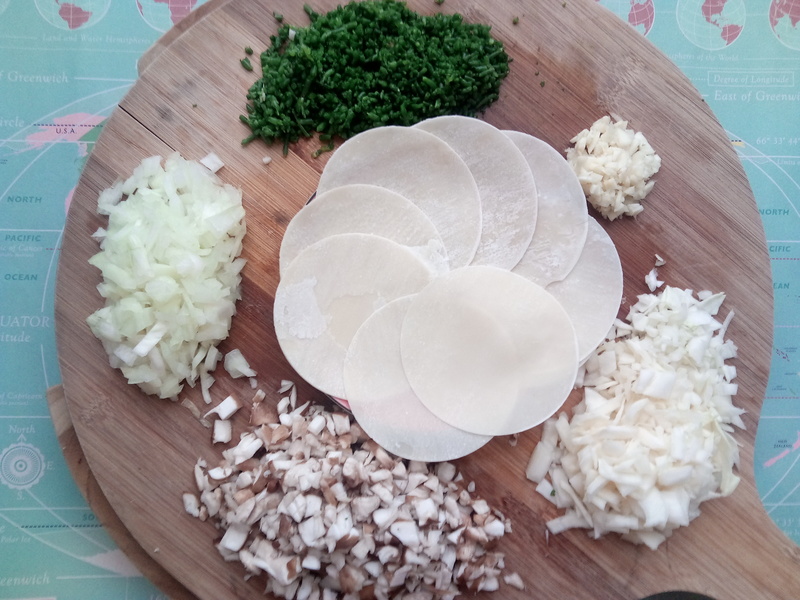 They need to be finely chopped because dumpling skins are thin and small, so you don’t want any chunks that might rip the dumpling. 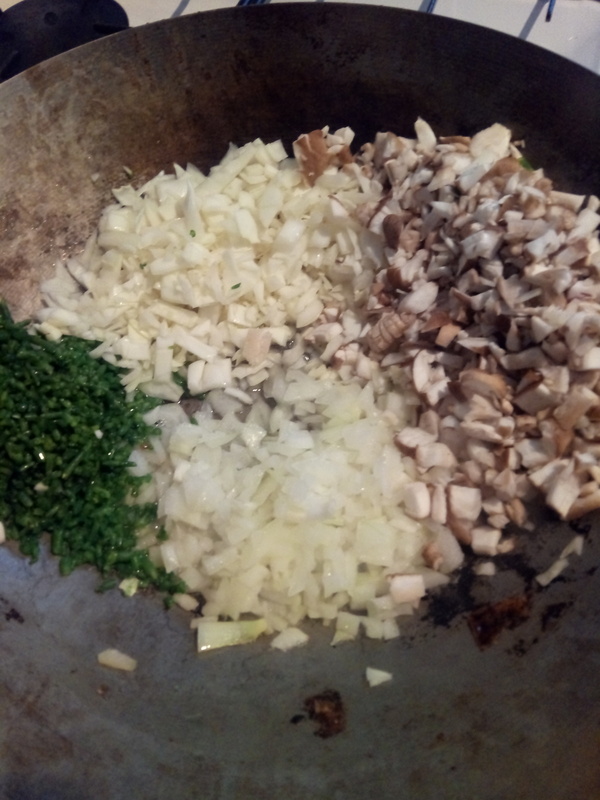 Next, put all the ingredients in a hot frying pan/ wok, until they’re cooked. Once cooked, here is what you are left with. 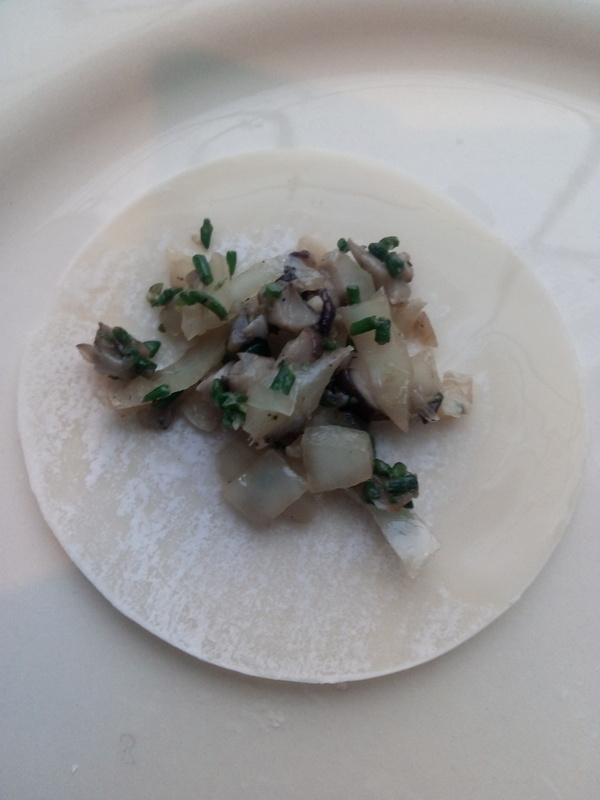 We’ll leave the amount of ingredients up to you, you might be less keen on mushrooms than us! 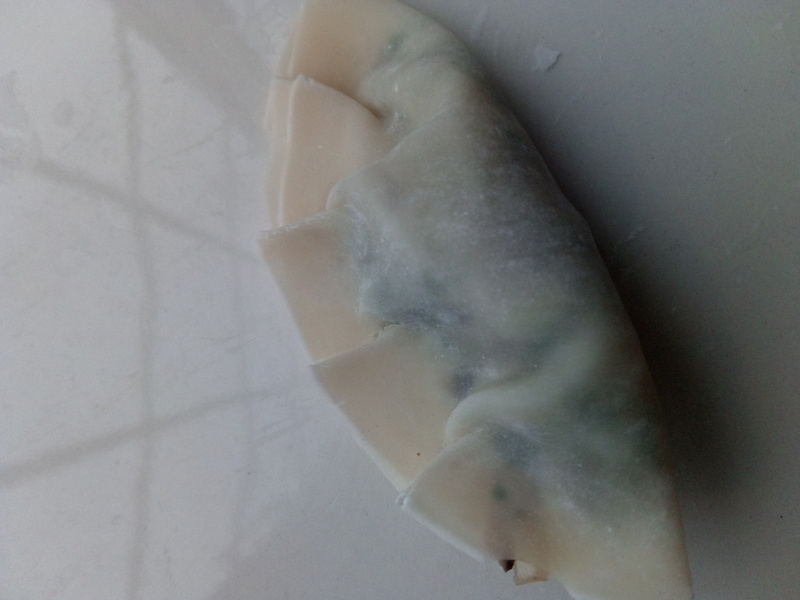 Though it might not look like it, the amount below will fill at least twenty five dumplings. Alright, it’s the tricky bit. 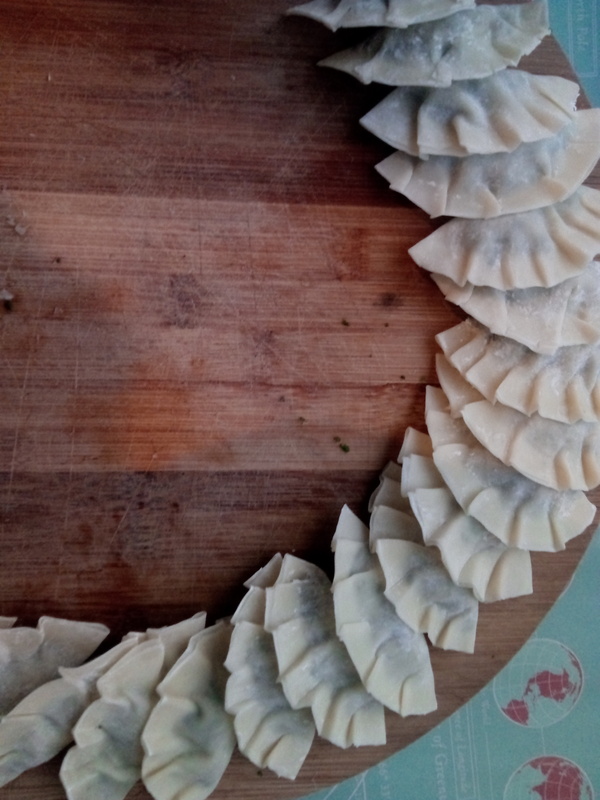 We are not saying that this is the right way to fold dumplings into a pattern – but it’s the easiest for us! First, put a small amount of filling into the middle of the pastry. Have a bowl of warm water ready so that you can ensure the perimeter of the skin is wet. This will make it stick. Fold it and press the edges together, ensuring that they are firmly stuck without any gaps. We then fold the skin over slightly as below, giving the impression of a fan. Now it’s time to find out why one of their names is ‘pot stickers’. You’ll need a hot pan and plenty of vegetable oil. Put them in and keep turning until they are all brown. Once they are all brown, they’re ready! 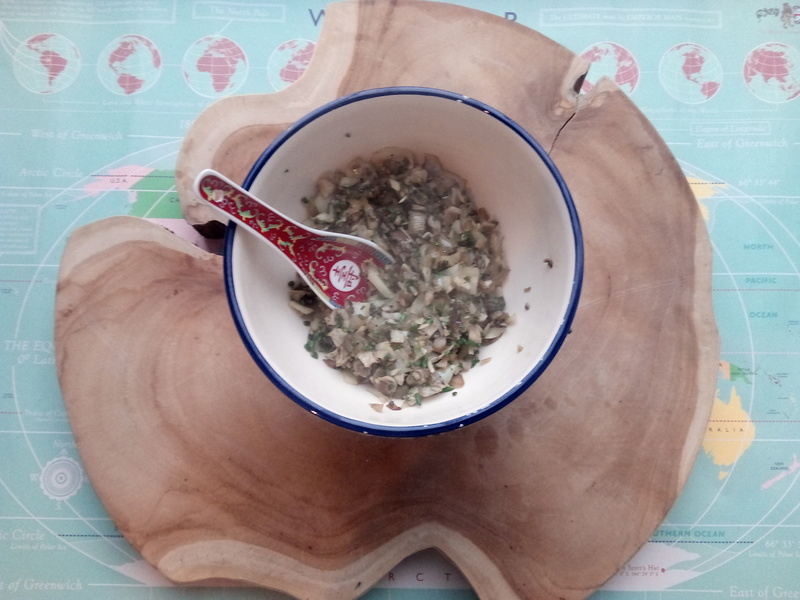 The recipe for the dipping sauce below is: 2 table spoons of soy sauce, 2 tablespoons of rice vinegar, a dash of toasted sesame seed oil, finely diced fresh ginger and a pinch of chilli flakes. Oh, and the best thing to go with dumplings? 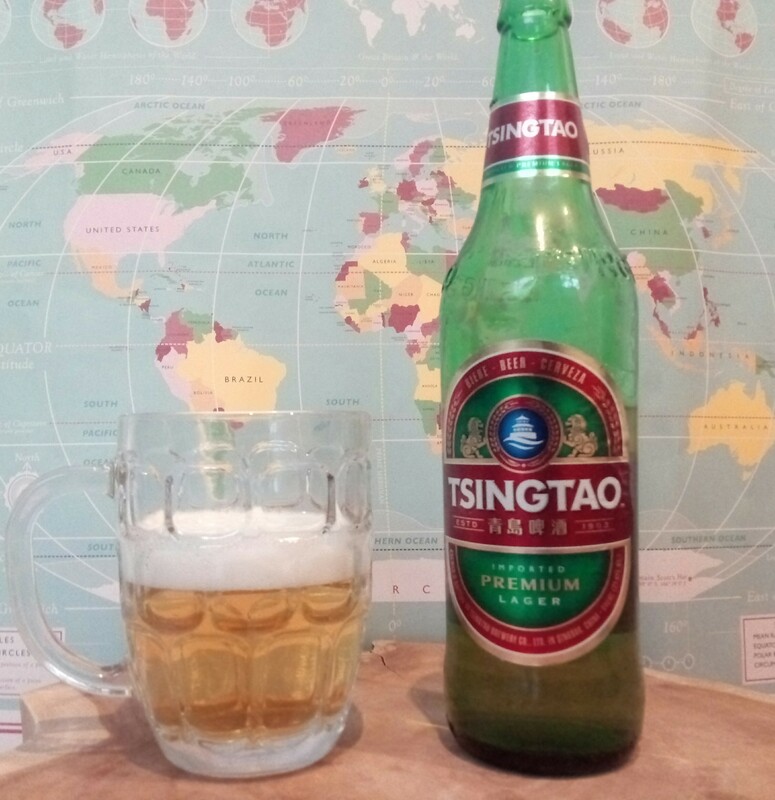 Our favourite Chinese beer, of course.